Burn a few calories so you can have an extra piece of pie! Our Thanksgiving Coed Mini will have you home in time for your feast. There's a 3 game guarantee, but a potential of 5 games if you keep up your winning ways. A nap will definitely be in order this Thanksgiving. Hosting a tournament is a great way to raise money for your cause. Rent the arena and put on your own show. We can help with finding referees and anything you else might need to run a successful and profitable event! Contact us for availability. 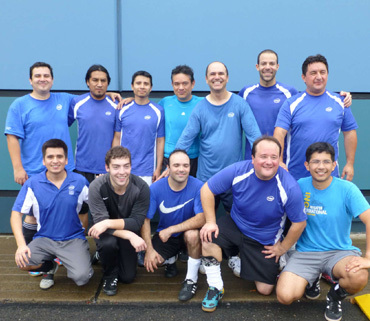 At Indoor Goals we hold two annual soccer tournaments. 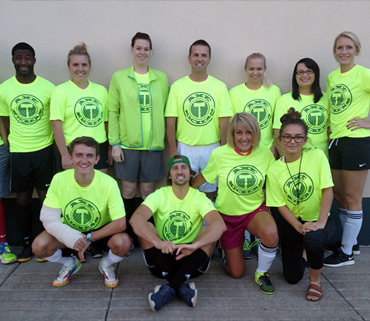 In September we hold our Corporate Challenge Mini Soccer Tournament where local businesses put together teams to compete in games that build comradery and team work in a fun and active way. In November it's time for our Thanksgiving Mini Coed Tournament. Starting at 8am and finishing by 1pm it allows for a nice little "run-around" before the Thanksgiving feast! 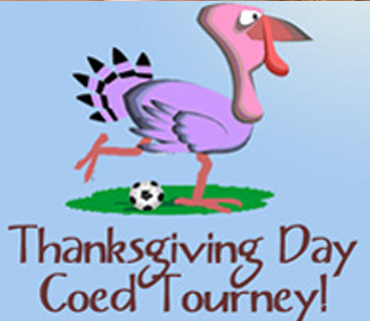 Our Thanksgiving Tournament is COED, which requires 3 women field players and 3 men field players. The goalie can be male or female. Our Corporate Tournament has 5 field players plus goalie, made up of male and/or female players. Both of our Corporate and Thanksgiving tournaments are "Mini" format (explained below). What is a "Mini" Tournament? A "mini" tournament is a one day tournament of six teams. The teams are divided into two pools and play a round robin of (2x12 minute halves) games. The teams go on to a playoff round and then finals. There is a 3 game guarantee in the mini tournaments, and the whole event is over in 5 hours! Cost: $250 per team; Three Game Guarantee. The fee includes referee fees. No player card necessary.